Ok, so if you know me, you know I have three teenage boys. Three handsome, kind, gentle giants. These boys are three of the hardest workers and players I know. They caddy during the summer and are ski lift operators during the winter. When they are not working they are skiing, hunting, swimming, or doing any of a million other things. With their active lifestyles come some…nasty smells, which has caused our van and other cars to have some pretty disgusting odors spew out the doors when you open them. Now, because the boys occasionally visit my blog, I better tell you the whole truth… I do Jazzercise three times a week and I won’t get graphic or anything but you can imagine right?…I don’t come out smelling as sweet as I did before the workout. So, all of those painful truths about my family to tell you… My van smells like FEET!!! Not the lotion covered feet of a sweet baby, but the smelly-I’ve walked around in wet shoes for days, kinda feet. You get the idea, right??!! So, when PERK asked me to try out their new innovative automotive air fresheners, I jumped on it! These automotive air fresheners come in a variety of fragrances, like Golden Vanilla, Caribbean Colada, New Car and more…this will make it easy for you to find one you love. 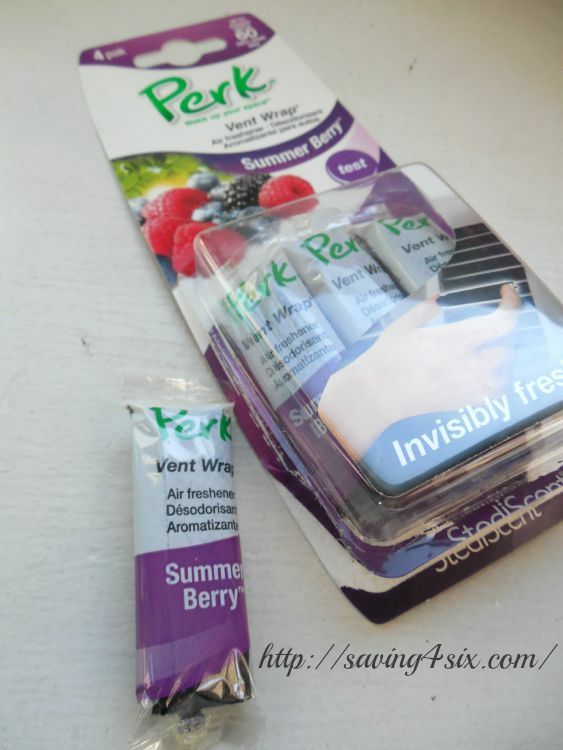 I opened up the Summer Berry one and each of the vent wraps is individually wrapped for long-lasting fragrance. Each PERK Vent Wrap lasts about 15 days, so a 4-pack offers up to 60 days of your favorite fragrance!! These PERK Vent Wraps are significantly more discreet than other vent air fresheners and are a cinch to install! 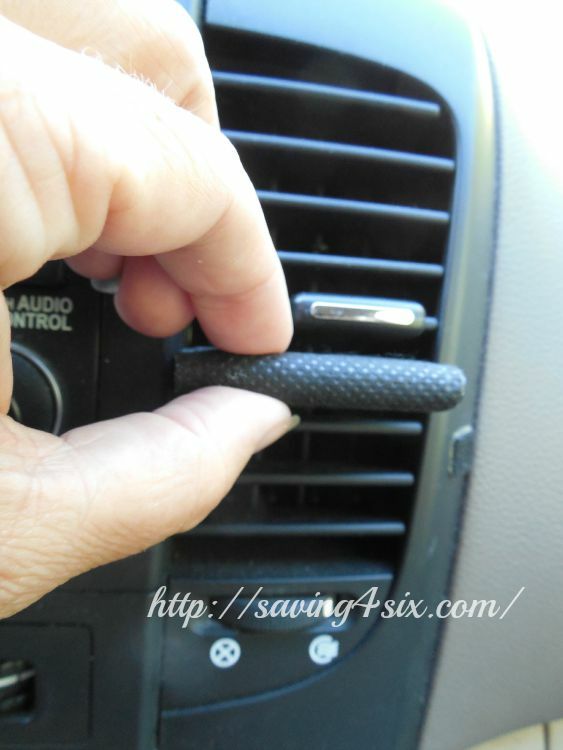 Head out to your car and pick a vent…simply slide the PERK Vent Wrap around your vent blade. And that’s it!!! The Vent Wrap doesn’t block air flow and allows your vent to be adjusted as needed, unlike other vent air fresheners. I’ve had the air fresheners in for a while now and my car smells like a basket of berries…WAY better than the smelly feet odor of the past!!! PERK products can be found at Walmart, Target, Advance Auto Parts, AutoZone, Meijer, Kroger, Pep Boys, Publix, CVS, and other places auto air fresheners are sold. Here’s a $1 off PERK coupon to get you started. You can also visit PERK’s Facebook for more information. 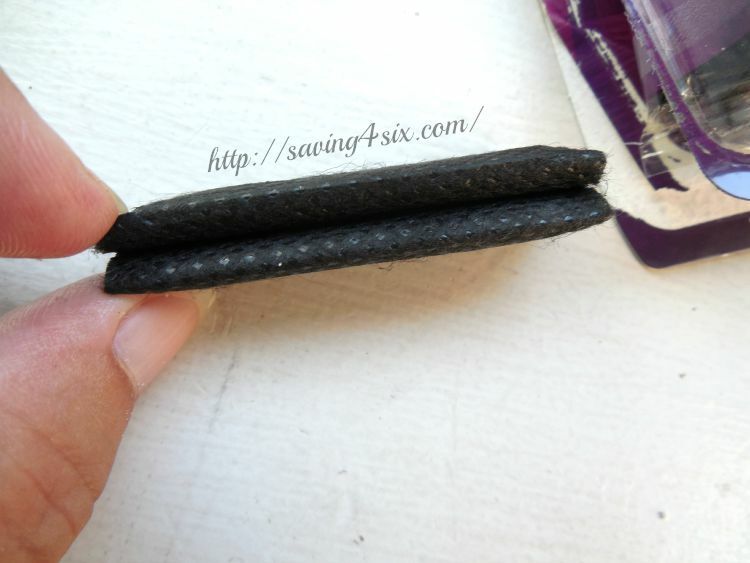 Here’s how to get in on the giveaway: Leave a comment telling me why you need PERK Vent Wraps for your car. That’s it! I will randomly select a winner September 28, 2015 at 9pm. Please be sure to leave your email address so I can contact you if you’re the winner. 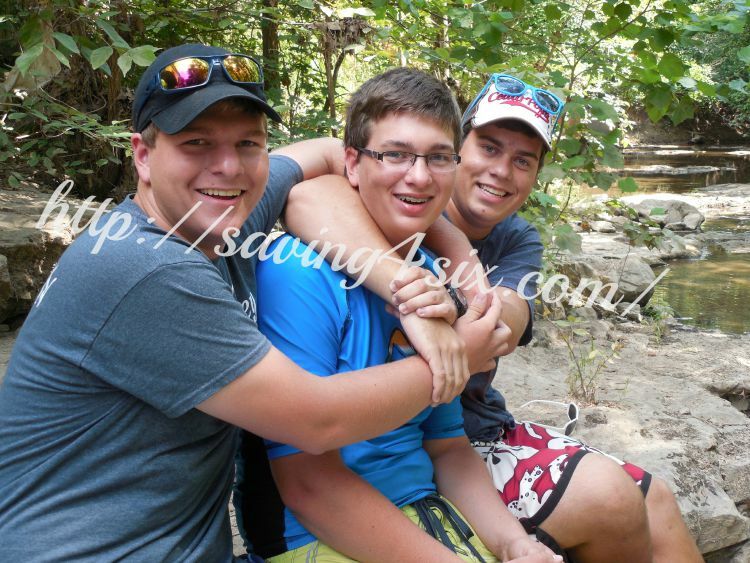 I have two very active teenage boys that love all things outdoors, in all sorts of weather. Couple that with the two dogs that almost always accompany them, you can imagine the smells that reside in our vehicle! I would love to have something that makes the van smell good. I also have a son that loves to fish and leave his pole and bait in the car, eeewww! He also mows yards and the mower stays in the van and the sweet smelling grass smell becomes the rotting grass smell after a couple of days in the hot sun! Then we add in the dogs that love to go to the lake with us……. Not a good smelling car most of the time. It’s a constant struggle to find products that actually keep your car smelling fresh for more than a week. Would love to give these a try ! it for any length of time, and got a headache every time! This sounds like just the thing for me! 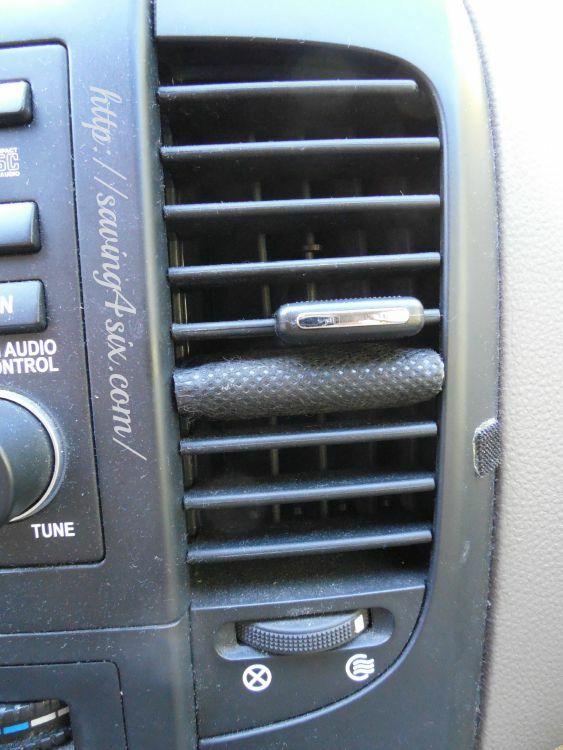 I need PERK Vent Wraps for my car because it always smells musty from wet towels and bathing suits! We spent a lot of time at the beach! I had a stain on one of my car seats and the remover used to get rid of it, the smell is still in my car and the stain is gone. I would love to have my car smell nice. Thanks so much for the chance! I have two sons like you who work hard and play hard. Sometimes sweaty jerseys and cleats are forgotten in my car. It is a PT Cruiser that has the trunk open to the interior, so, that gets bad quick and you know it lol. 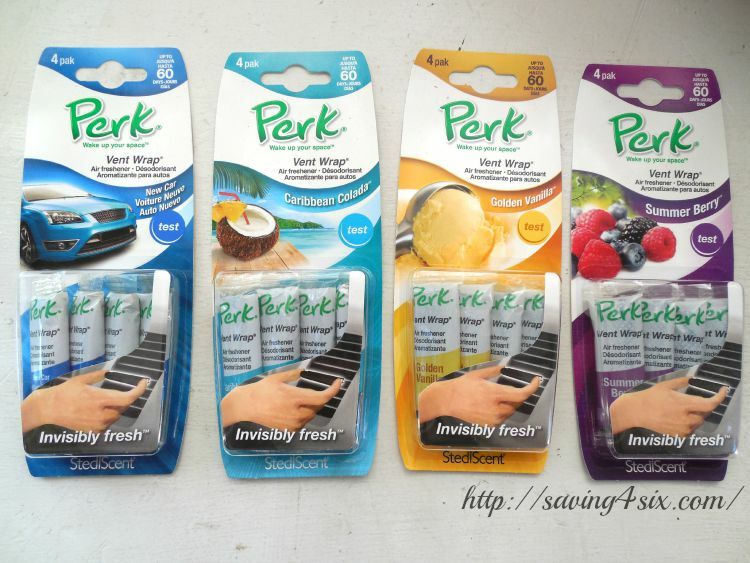 I sure could use some Perk Vent Wraps in my car!! Between the grandson who “hides” his sippy cup in my car (eeeww, sour milk!!) to the wet dog who insists on riding along, you can imagine what my car smells like!! Then the hubs will use my car to run errands on the week-end and inevitably leave his coffee cup, have drunk, in the cup holder. Which the dog bumps in to and spills all over the carpet!! Ugh!! The smells in my car would send a skunk running!! HELP!! I need Perk Vent wraps because my boys sweaty sporting gear (and bodies!) stinks up my car! I just can’t seem to get away from the smell of sweaty teenage boys! There is no way around it. We are a gassy family. Driving along in this beautiful fall weather can be RUINED in an instant with no warning whatsoever. All of a sudden, the wafting stink permeates the entire van. There is no warning. There is no escape. We need some Perk Vent Wraps!